Though I promise "Travel & Adventure in Central Europe" on my blog, in fact I still have a few regional blind spots. I haven't been to Belarus yet, and big parts of Ukraine are still on the "to do" list. For years, the Russian enclave of Kaliningrad -- that little piece of ex-USSR wedged between Poland and Lithuania and far from the Russian mainland (see map plot, below) -- stood out like a sore thumb. Thanks to a Lonely Planet research project, I managed to cross it off the list last summer, but the trip left me scratching my head about why we travel in the first place. Truth be told, there aren’t many "must-sees" there, but maybe that’s beside the point. It’s a fascinating place to visit in its own right, and part of the fascination is that it exists at all. Top Photo: An oversized monument to Russia's cosmonauts, including Alexey Leonov, the first man to walk in space, is just one obvious clue that, yes, you've bumbled into a piece of Russia in the European Union. Photo by Mark Baker. Posted in On The Road and tagged Curonian Spit, European Union, FIFA, football, Kaliningrad, Kant, Lithuania, LonelyPlanet, Russia, soccer, Travel, travel writing, World Cup. Seven surviving 19th-century Prussian gates ring the city and serve as a constant reminder of the past. This is Dohna Tower, which is part of the Rossgarten Gate and now home to the Amber Museum. Photo by Mark Baker. Even in Kaliningrad it can get pretty hot. 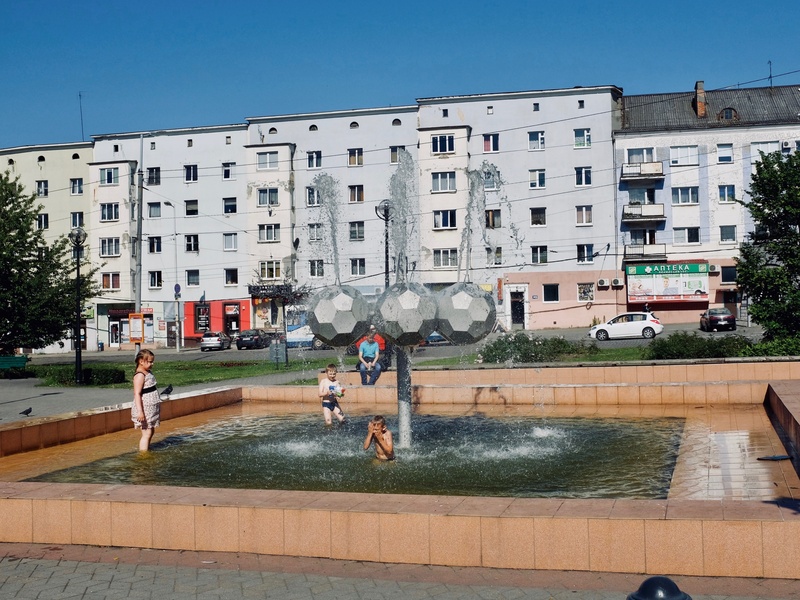 This is a bunch of kids playing in a fountain on an unexpectedly torrid early-summer day. Photo by Mark Baker. 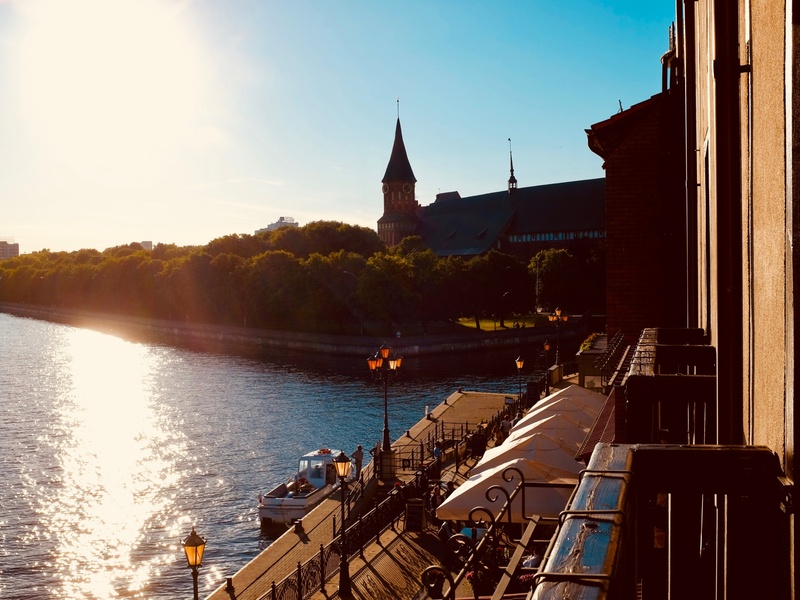 One of the biggest attractions for visitors is to stroll along the banks of the Pregolya River, which connects the city to the Baltic Sea. Photo by Mark Baker. Of the surviving Prussian military gates, the hulking 'Zakheim Gate' was my favorite. This was one of eight red-brick defensive gates erected in the middle of the 19th century. Today it houses an art gallery. Photo by Mark Baker. I know the analogy isn’t perfect. Russia acquired Kaliningrad as part of the spoils of war after having defeated Nazi Germany in World War II, and for more than 40 years, Kaliningrad was actually attached to the Soviet Union by the fact that neighboring Lithuania was also part of the USSR (so it wasn’t always technically an “enclave.”) But, still, that analogy is close enough. Just as it would feel odd, indeed, to drive over a border somewhere in Germany and straight into the heart of West Virginia, so it is on the short hop over the line to Kaliningrad from Poland or Lithuania. It’s an island of Russian (and vestiges of Soviet) culture surrounded by a sea of European Union blue. A view of 'Fish Village' -- not quite the quaint place the name suggests, but nevertheless a popular spot for restaurants and bars. Photo by Mark Baker. A look over at Kalingrad's 14th-century Cathedral and Kant Island from near the 'Fish Village.' Photo by Mark Baker. One of the highlights of visiting the city's 'Museum of the World Ocean' is the chance to scramble around some old Russian research boats. Photo by Mark Baker. 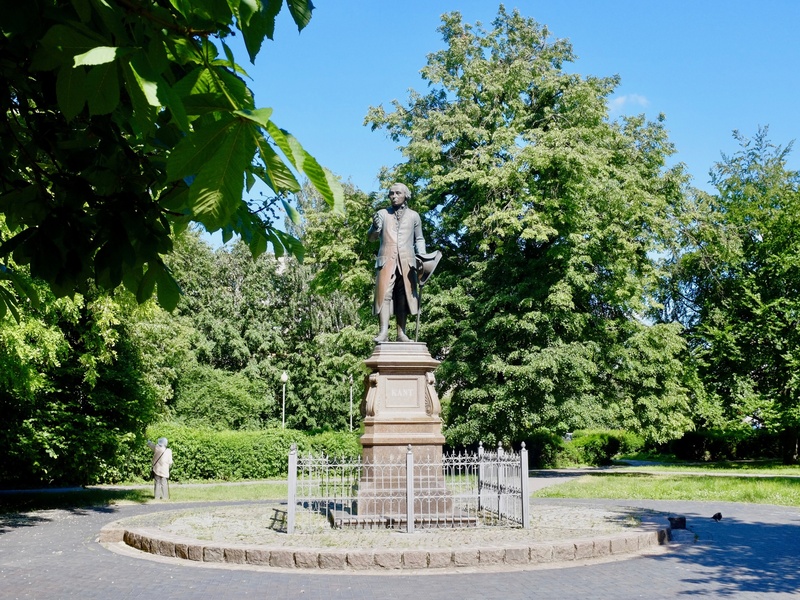 In many ways, Kaliningrad still belongs to Immanuel Kant (1724–1804), the philosopher who spent most of his life in Königsberg. Photo by Mark Baker. 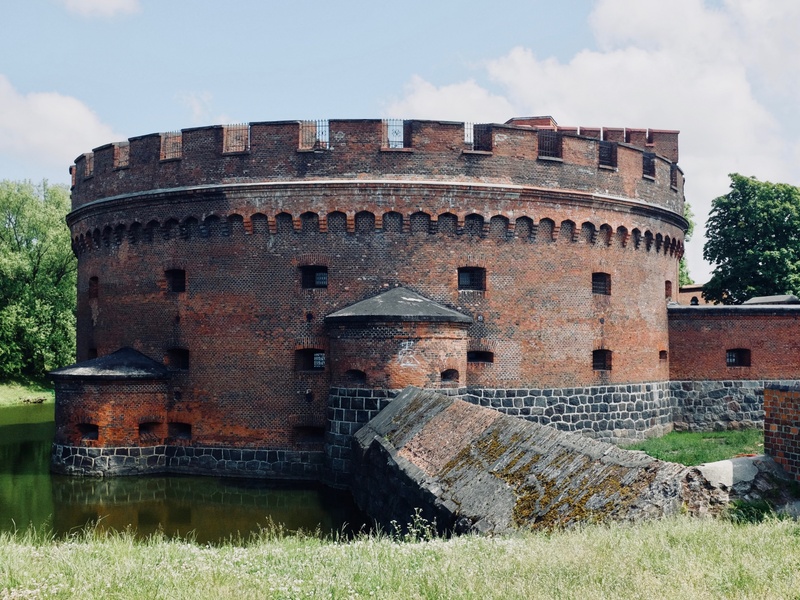 Here's a short primer on Kaliningrad for readers who might not be completely familiar with its story: The region’s origins go back to the 13th century, when Kaliningrad – then known as Königsberg -- served as one of the main redoubts for the Teutonic Knights, an order of medieval crusaders who’d repaired to the Baltic Sea region after having been pushed out of the Middle East. The order’s goal back then was to Christianize pagan Prussians and Lithuanians, a feat they carried out with ruthless efficiency. Over the years, the Knights managed to alienate just about everyone in their vicinity (including Poles, Lithuanians, and the pope) and they were eventually defeated in battle in 1410. Königsberg, though, prospered due to its access to the sea and proceeds from the lucrative amber trade. The city later emerged as the capital of the German province of East Prussia. Among its various claims to fame, it was the birthplace of both philosopher Immanuel Kant and possibly the ancestors of American film director Woody Allen, who was born “Allan Stewart Konigsberg.” True fact. And then came World War II. As the easternmost German city before the war, Königsberg found itself poorly situated in 1943 and ’44 as the war turned decisively against Nazi Germany. The end came in the winter of 1945, when the Soviet Red Army launched a massive offensive that ended in German capitulation in April. Much of the city was bombed to rubble, and one of the most poignant surviving sights from that period remains underground: Germany’s command bunker, where the surrender was agreed to on 9 April 1945. After the war, the Soviets annexed large parts of former-German East Prussia, expelled the surviving German population, and replaced the expellees with Soviet citizens. 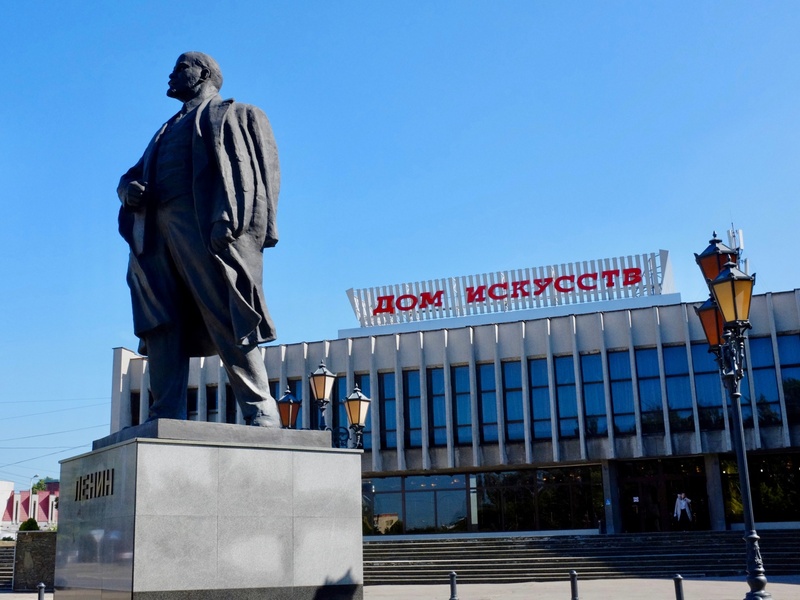 The city and surrounding region were renamed “Kaliningrad” to honor a high-ranking Soviet official, Mikhail Kalinin, who'd conveniently died in 1946. 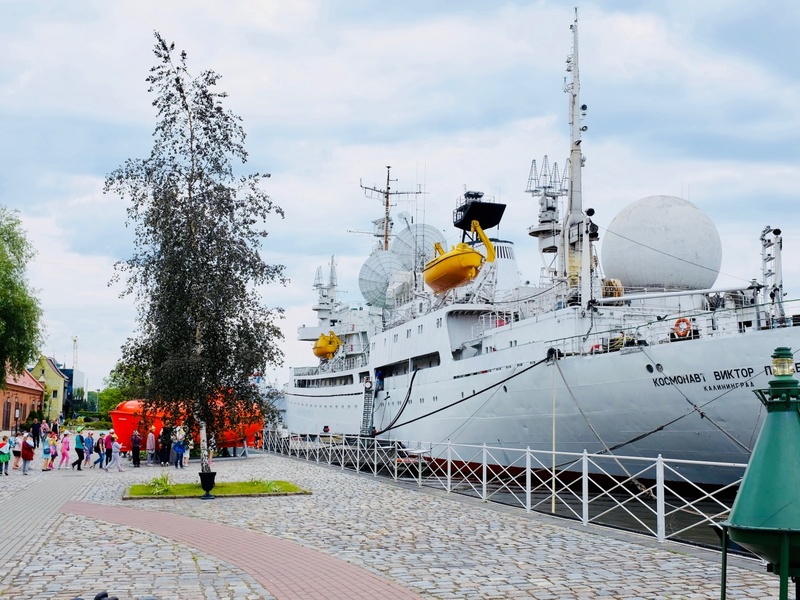 Because of its strategic maritime location, close to NATO naval bases, Kaliningrad was given a military cast and closed off to Westerners. These days, while it’s more accessible, the city retains an essence of that enforced Cold War isolation. 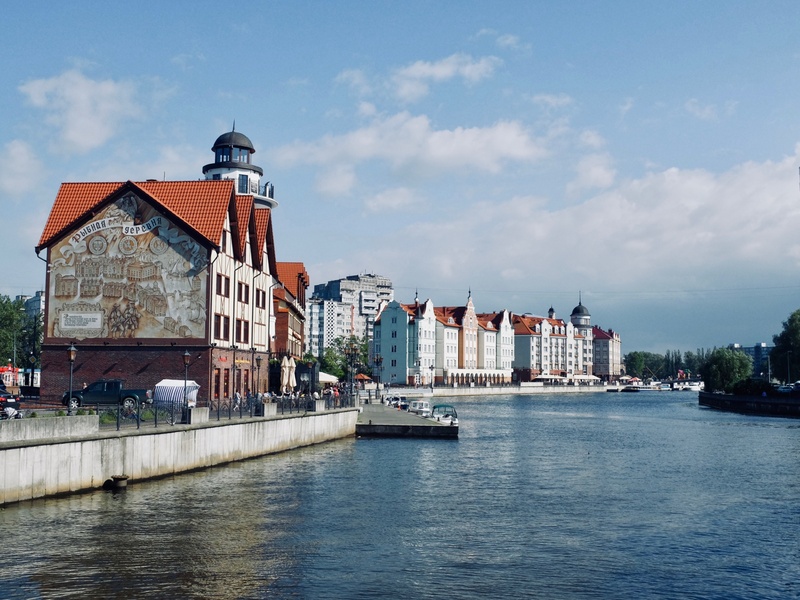 From the end of World War II to the collapse of the USSR in 1991, Kaliningrad’s westerly location didn’t stick out much as a geographic oddity. After all, the three Baltic countries (Lithuania, Latvia, and Estonia) were constituent parts of the USSR as well, and neighboring Poland, to the south, was part of the pro-Soviet Eastern bloc. To the contrary, on maps from the 1970s and ‘80s, Kaliningrad appears simply as a logical extension of the Soviet landmass to the Baltic shoreline. That changed dramatically with Lithuania’s declaration of independence in 1990 and the dissolution of the USSR a year later. 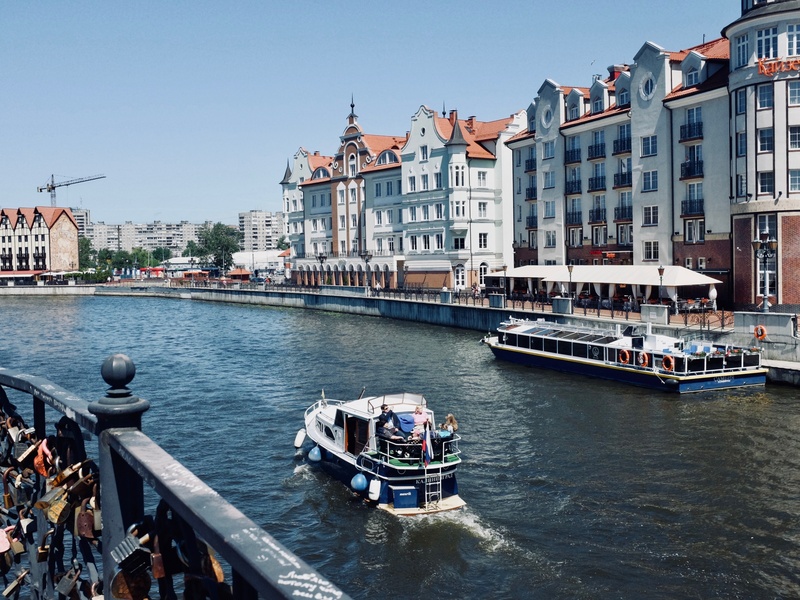 Once Lithuania and Poland joined the European Union in 2004, Kaliningrad’s precarious position as a Russian region, well outside of the Russian Federation, was fully exposed. These days, it’s not possible to enter Kaliningrad by land without first passing through the EU. A fact that, well, just seems strange. One of the few surviving relics of the city's German past is the 14th-century Cathedral on Kant Island. These green lawns around the church were once densely packed urban streets. Photo by Mark Baker. 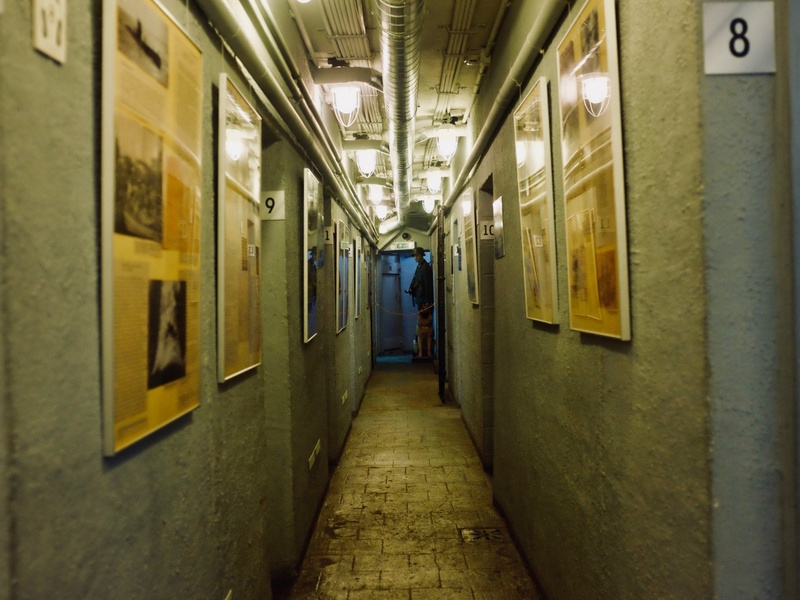 The dark and narrow corridor of the former German WWII command bunker is now a museum. It was here where Russians and Germans met in April 1945 to sign over the surrender of the city. Photo by Mark Baker. Another view of the Pregolya River and 'Fish Village,' showing off the buildings' mock-timber, German-style facades. Photo by Mark Baker. 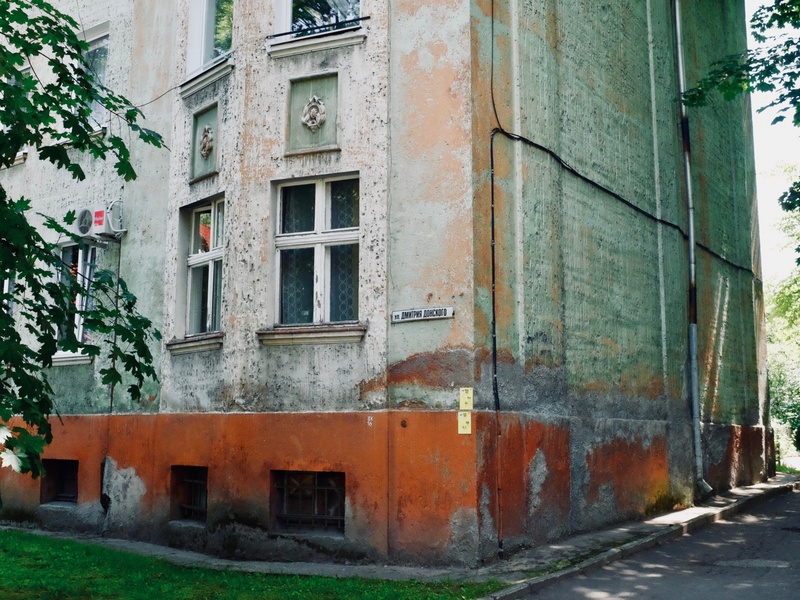 Here and there you can spot evocative remnants, like blackened redbrick buildings, that reflect historic Baltic-region architecture. Photo by Mark Baker. So, what to make of this Russian enclave that sits a mere 100 miles (160 km) from the Polish port city of Gdańsk, but a full 800 miles (1250 km) west of Moscow? Before my trip, I wasn’t sure what to expect. I’d read that Soviet planners in the 1960s and ‘70s had built some monumental (and often hideous) structures, including the (not quite so-bad-it’s-good) “House of the Soviets” (see photo, below), in their effort to erase any vestige of surviving Prussian heritage. 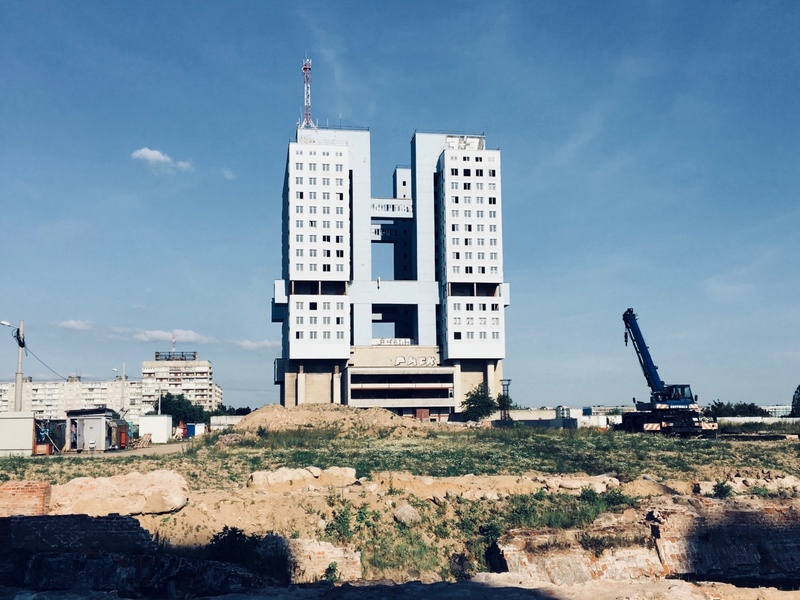 (The House of the Soviets, by the way, is still standing – an enormous H-shaped structure that cost million of rubles to build but was ultimately never commissioned.) The 1990s, though, after Kaliningrad was severed from the Russian mainland, were some tough years for the city, and poverty and crime became serious problems. One of the questions I had for myself before going in was whether Kaliningrad was still essentially a German city, with a coat of Russian (or Soviet) glaze, or whether it was by now an authentic Russian city, built on a German foundation. After having spent a couple of weeks there to take it all in, I’d say the answer is a bit of both, and mostly neither. The sheer scale of the place – more Soviet than German -- took me by surprise. I’d been expecting a compact city, more on the scale of a German regional capital like Nuremberg or Dresden, but the walk from the bus and train stations in the southern part of the city to my hotel in the northwest neighborhood of Amalienau easily took the better part of an hour. (There are plenty of buses and taxis, so the distances aren’t really an issue). The lack of a central or historic core was also, at first, a little disorienting. Maybe I’ve spent too much time in Central Europe, where cities inevitably begin at some medieval square and move outward from there, but I never did succeed in locating Kaliningrad’s “center.” It’s clear the busy intersection at Ploshchad Pobedy (Victory Square), in the northern part of the city, is the modern commercial hub, but how about the historic core? My old Königsberg maps told me that area was south of Ploshchad Pobedy, closer to Kant Island, but these days that part of the city is a mass of highways and flyovers. 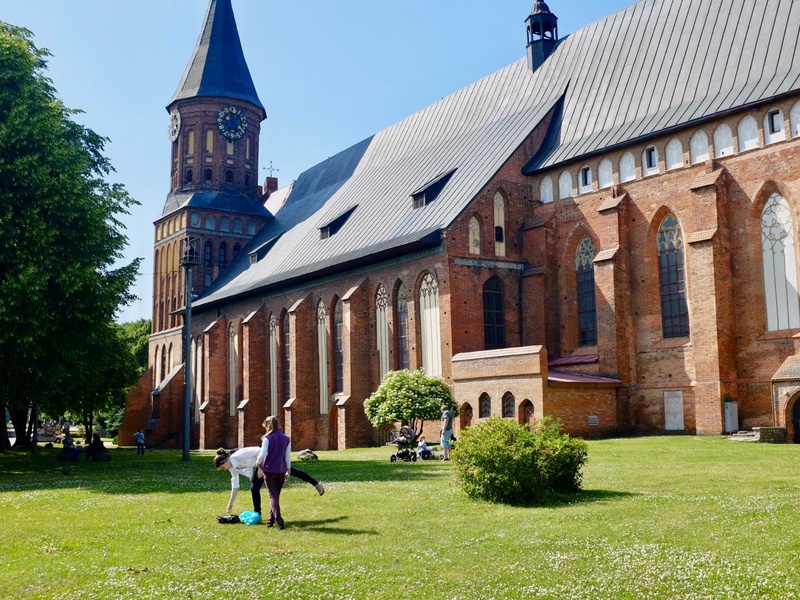 The island, itself, was once a densely populated piece of the “Old Town” before the war, and is still home to the Kaliningrad’s beautiful 14th-century Cathedral, but it’s sadly trapped in the middle of a concrete labyrinth. The island itself is mostly parkland. My sense was the Soviet planners simply bulldozed the old street plan along with all of the bombed-out buildings. 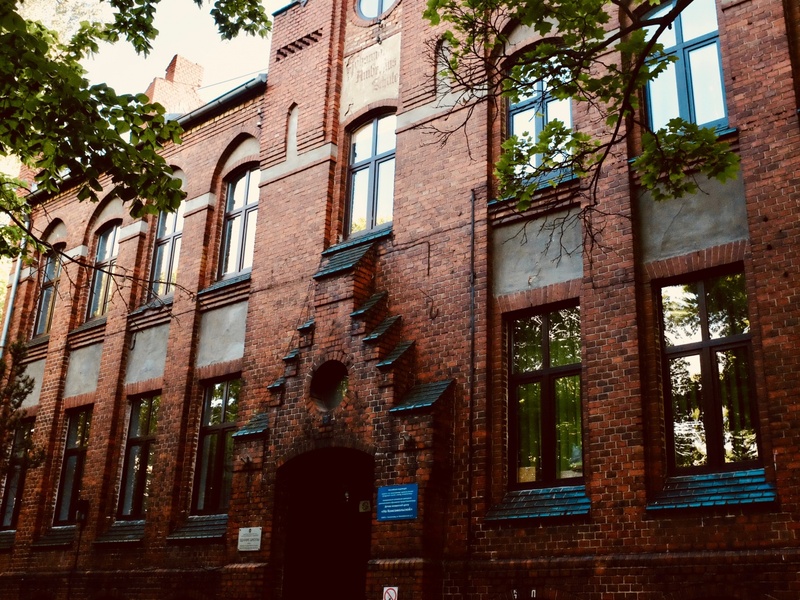 Yet, there are pockets of old Königsberg that leap out at unexpected points that show the city remains something of a Prussian-Soviet hybrid and a trove for cultural archeologists like me. I was especially taken with the surviving redbrick Prussian gates that once formed part of the city’s defenses in the 19th century and today mark out the extents of the old town. 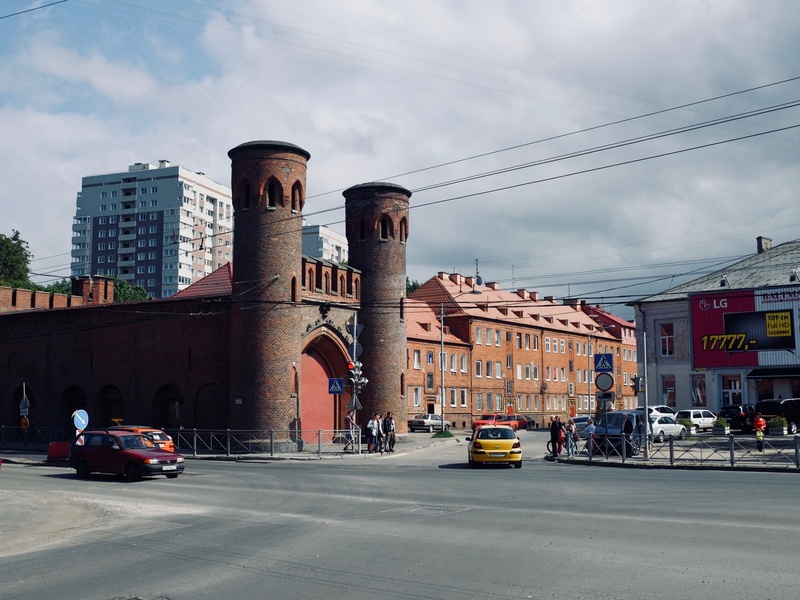 Seven of the original eight gates, built in the mid-19th century in neo-Gothic style, survived World War II, and their facades are still blackened by the war and decades of exhaust from passing Lada cars. 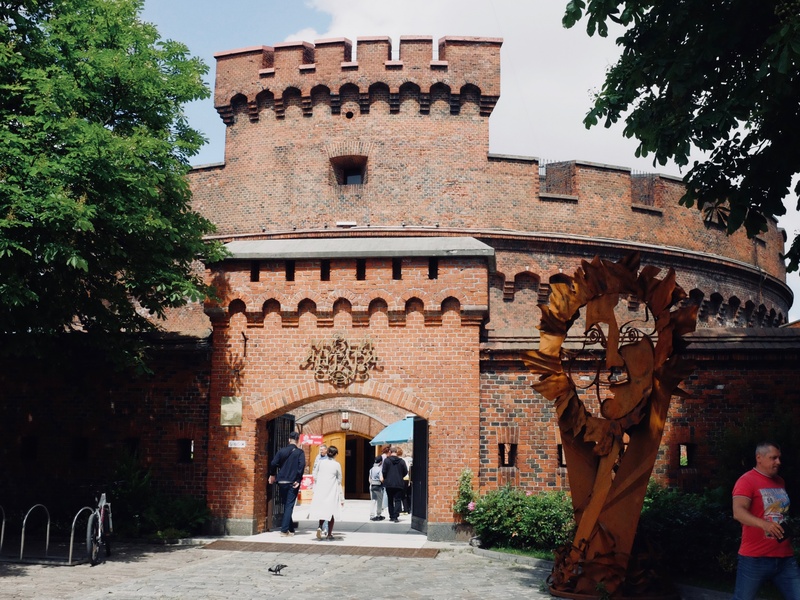 Some of them, such as my personal favorite, the hulking Zakheim Gate (see photo), are being restored and put to alternate uses (the Zakheim Gate has been repurposed into an arts center). The old Dohna Tower and adjoining Rossgarten Gate, another piece of old Prussia, house the city’s Amber Museum. Walking around the periphery and seeing those old Prussian gates reminded me a little of the Romanian city of Sibiu, another place (admittedly in a different part of Europe with a different history) where the old Saxon presence has lingered on in the architecture long after the last actual German residents have left. South of Kant Island, “Fish Village” isn’t quite as quaint as the name suggests, but it’s nevertheless a pretty spot along the Pregolya River for a walk followed by some coffee klatch and cake. This section of Kaliningrad, not far from the port, was obliterated in the war, but here the Soviet planners thankfully opted to give the houses mock timber facades that recall medieval German Fachwerkhäuser. Squint your eyes for a moment, and, yeah, this might be old Königsberg after all. Kaliningrad’s outer residential areas, such as Amalienau, where my hotel, the Chaika, was located, were largely spared the ravages of war, and it’s perhaps here in the low-density streetscapes of villas and townhouses where the spirit of the old city survives best. This was my go-to hood for after-research, after-dinner walks to catch my breath and relocate my historical bearings (I really have been in Central Europe too long). During those walks, I'd spy those beautiful stone houses crying out for some renovation love and indulge my inner-real estate agent. What if I bought some property here and fixed it up? But wait, this is Russia, and therein lies the rub. 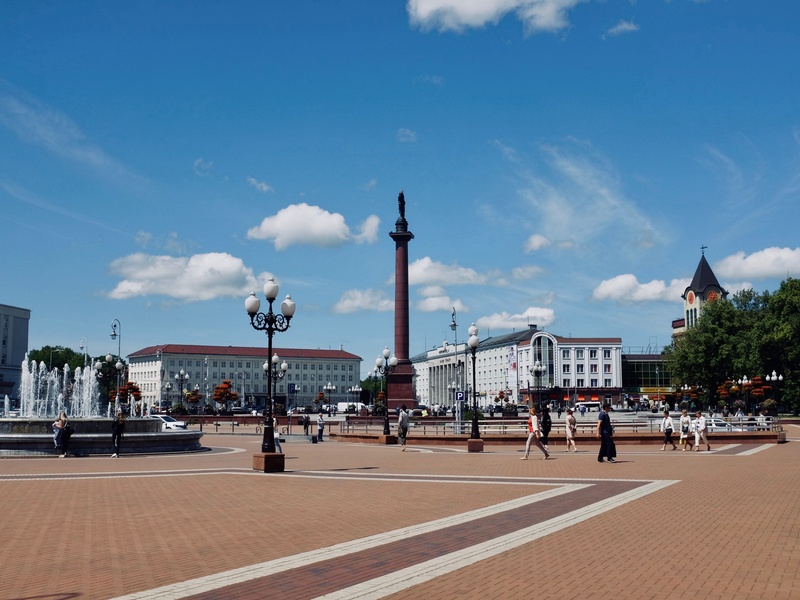 Wide Ploshchad Pobedy, or Victory Square, in the northern part of the city, is the commercial heart of modern Kaliningrad. Photo by Mark Baker. Lenin still stands proudly from his perch in the southern part of the city center, near the train and bus stations. Photo by Mark Baker. 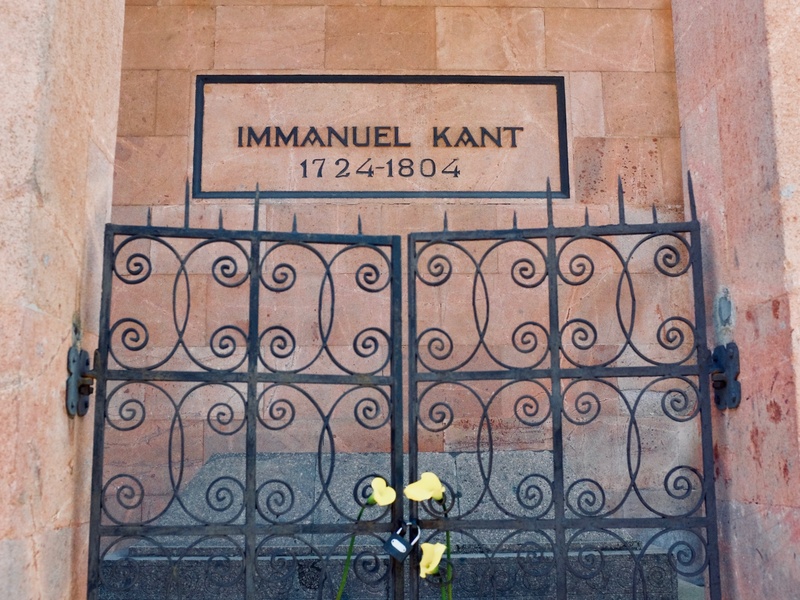 The tomb of native son Immanuel Kant. Find it on the northern edge of the exterior of Kaliningrad Cathedral on Kant Island. Photo by Mark Baker. The entrance to Dohna Tower, part of the old Prussian Rossgarten Gate and now home to the Amber Museum. Photo by Mark Baker. As pretty as Kaliningrad is in spots and as fascinating as it is almost everywhere you look, it was hard not to notice the feeling of isolation that still permeates the place, long after the end of the Cold War. 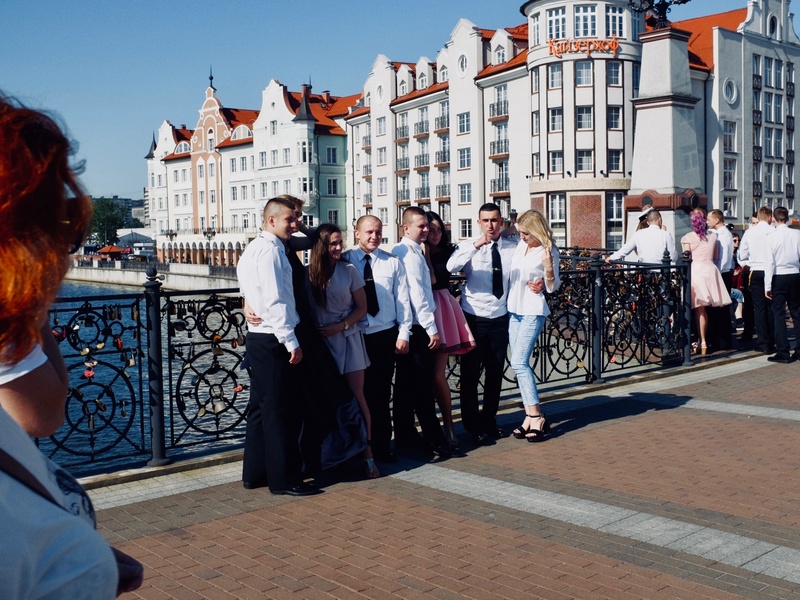 It took me a while to recognize what was missing, and it came to me only after I left: What Kaliningrad needs are tourists. The dangers of overtourism are well documented, but the dangers of “undertourism” might be just as damaging. Tourism brings with it money, energy, and an outside appreciation of places and stories that locals take for granted or simply don’t recognize. It’s not that there are no tourists here – and certainly many Russians from around the country do visit – but the colorful parade of Germans, French, British, Italians, and, yes, even Americans, was missing. To remedy that, perhaps, the Russians selected Kaliningrad to serve as one of their host cities for upcoming FIFA World Cup 2018 football championship this summer, and in an ordinary year, that might have helped to reintroduce the city to the continent. 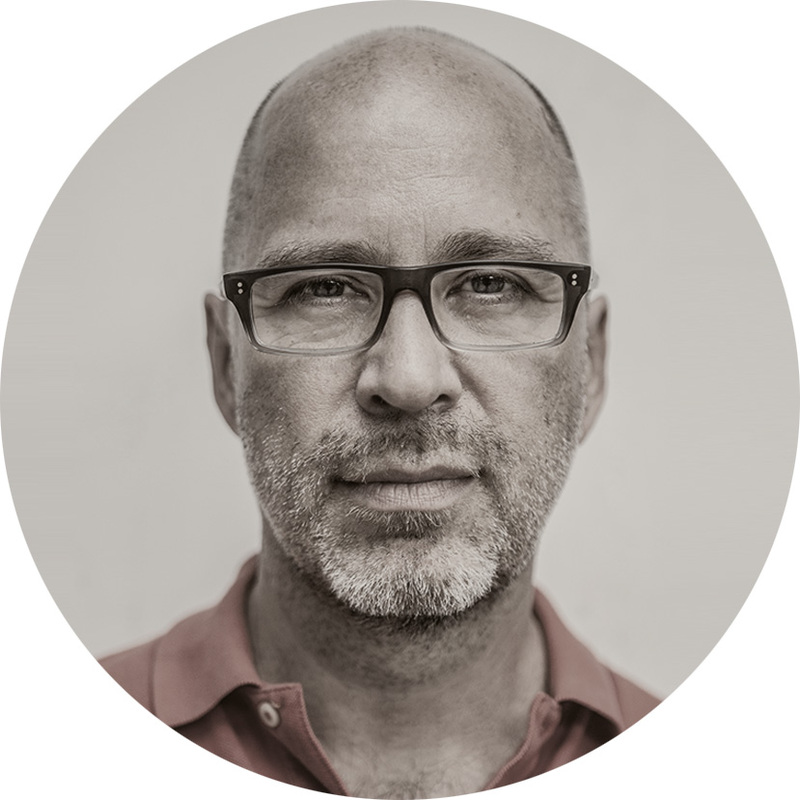 But given the string of recent political events, in Britain, the United States, Syria, and many other places, that have strained Russia’s relations with the outside world, my great fear is that this World Cup might just be a bust. And that would be a shame. 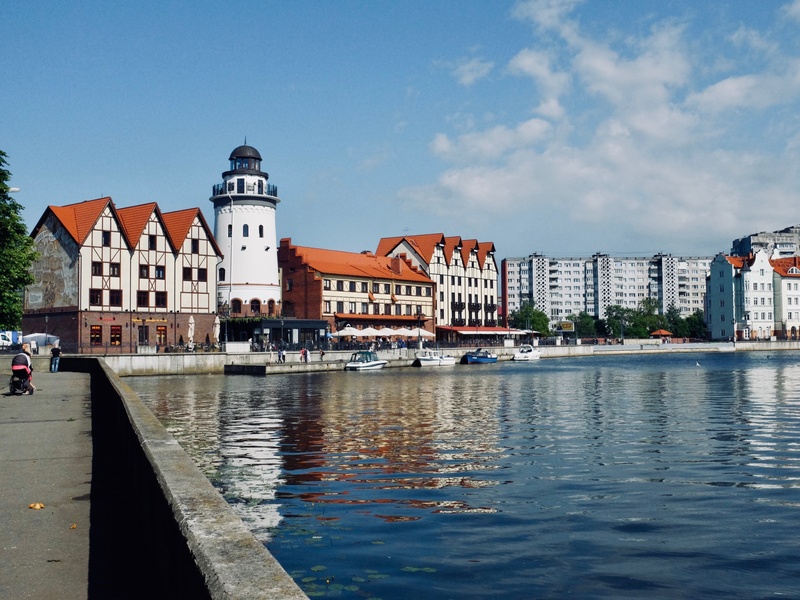 Kaliningrad is an integral part of Europe, and it’s time it came in off the island. Follow this link to find a handy guide to the FIFA World Cup match schedule. The first match in Kaliningrad pits Croatia against Nigeria on 16 June. Pick up a copy of Lonely Planet’s recently updated travel guide to Russia to read more of my adventures in Kaliningrad and for tips on what to see and do around the country. For more on Russia, listen to episode #605 of the Amateur Traveler podcast, where I speak about all of the amazing sights and cities along the Volga River. Strolling through the old neighborhood of Amalienau, you see all kinds of pretty but derelict buildings in need of renovation. Photo by Mark Baker. Russian sailors pose for a photo along a bridge in 'Fish Village.' Photo by Mark Baker. 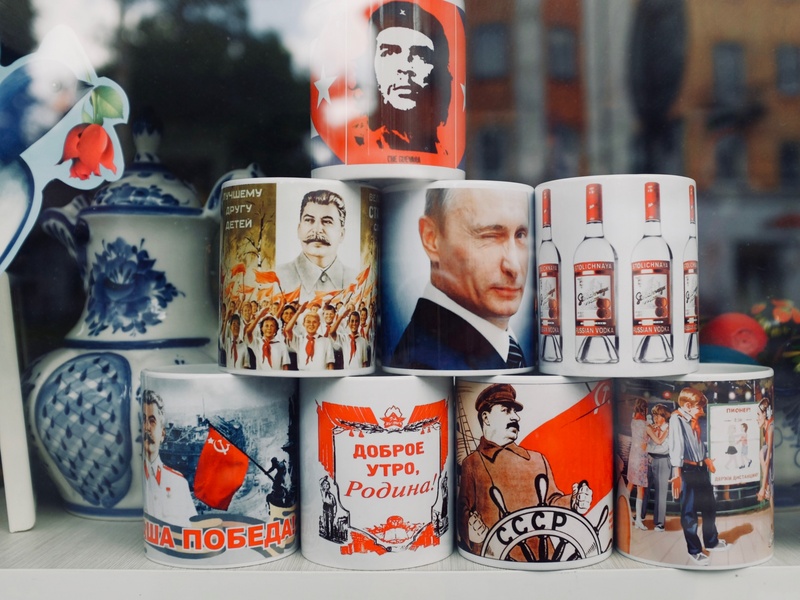 A Kaliningrad souvenir shop, featuring mugs of Stalin, Putin, and Che Guevara, among others. Photo by Mark Baker. An homage to film director Woody Allen, who was born 'Allan Stewart Konigsberg.' 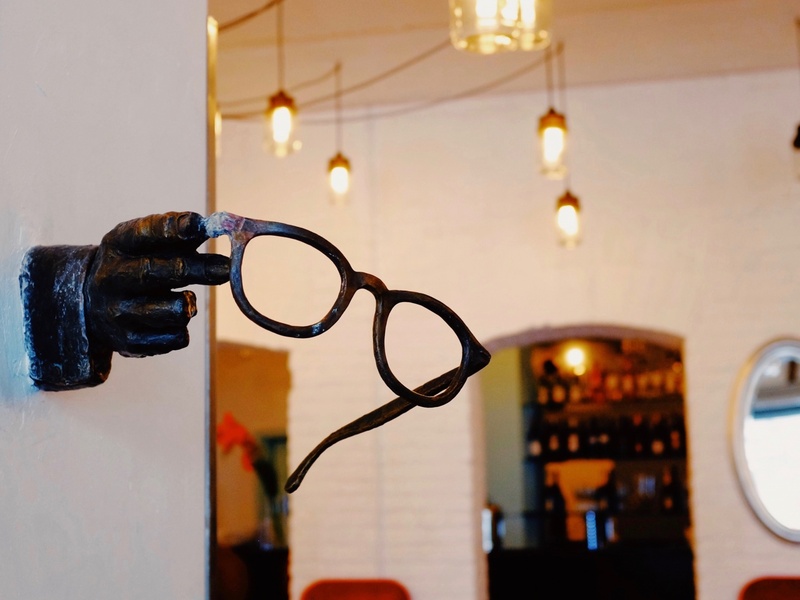 Here are Woody's iconic glasses, mounted onto the wall of a downtown cinema. Photo by Mark Baker. The now-abandoned 'Dom Sovietov' (House of the Soviets) was built in the '60s on the site where old Kaliningrad Castle once stood. The building was constructed on unsafe land and the project was never completed. Photo by Mark Baker. Kaliningrad will be one of Russia's host cities for the FIFA World Cup 2018 football championship. 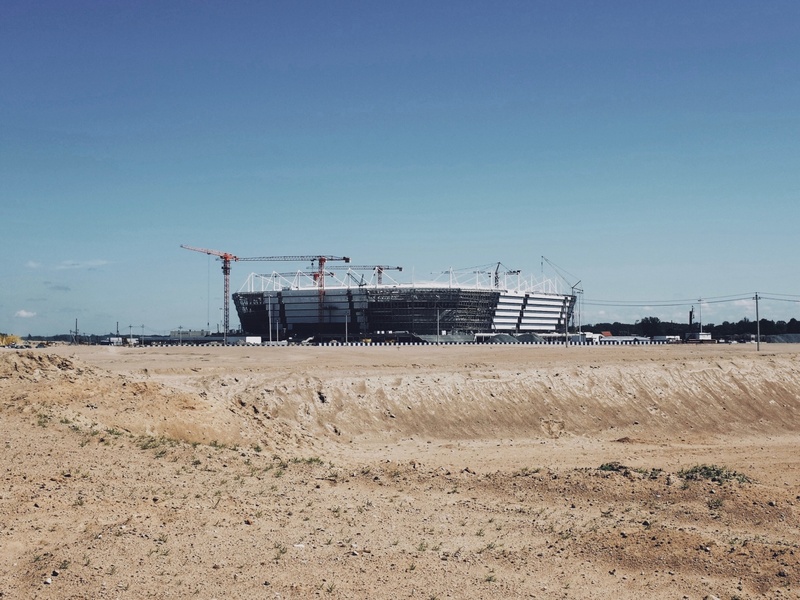 Last summer, the new stadium was still very much a work in progress. Photo by Mark Baker. I was hoping you’d discuss this in the article but I didn’t see it. Any chance you’ve written about this somewhere else? I’d love to read more on this idea. Koenigsberg, now Kaliningrad, was practically pulverized during WWII by mainly British bombardments. When the Russians moved in there, they did not “expel” the indigenous population, they either killed them outright or starved them to death. There were hundreds of children, called the wolf’s children ( Vilko vaikai) who were literally tossed over the fence into Lithuania by starving parents, in hopes that someone will take them in and keep them alive. The Russians have a very major military position there; they have hundreds, perhaps thousands of short and medium-range missiles there (Iskander type), two major military air bases, submarine bases and, of course, a major part of their Baltic Fleet of warships. The Russians’ war machine’s presence in Kaliningrad is a major threat to not only the Baltic statees but to all of Europe. These are all good points and I certainly don’t mean to minimize Russia’s responsibility for Kaliningrad’s isolation. Indeed, Russian visa and other policies are discouraging visitors and making the situation worse. Thank you for leaving a comment. Glad you made those points, Mindaugas. As a Brit, I have always been aware of the RAFs role in flattening German cities and visiting Dresden was something that brought home the horrors of that, but until I moved to Lithuania, I knew nothing about the British role in destroying Koenigsberg. I don’t think many Brits do. did you try the original Königsberger Klopse, you know the meat balls in white sauce with capers ? It’s a traditional Prussian specialty from Kaliningrad. I certainly did! Delicious — but not in Kaliningrad city, but along the coast.